The Nats (and every other team) face an 11/19/10 deadline to add Rule5 eligible players that we want to protect to our 40-man roster. (Coincidentally, I maintain a spreadsheet online of key MLB off-season dates and their implications for the team. The link is also available in the “NatsArm Creations” section on the links section to the right of this page). NatsInsider.com writer Zuckerman beat me to the punch on this topic (which I wrote up last weekend but forgot to publish), but here’s some similar analysis. Nats bloggers/analysts at the time surmised that we were gambling by not putting on guys like Erik Arneson and Hassan Pena or even local favorite Josh Wilkie (especially after he appeared in 2009’s Arizona Fall League), but we only ended up losing Zech Zinicola to the Rule5 draft. We lost him to Toronto, who had former Nationals executive Dana Brown picking up a player he was familiar with. Toronto eventually returned Zinicola to the franchise, and he split time between AA and AAA as a middle reliever. Ironically, two of last year’s Rule5 protection players are now candidates to be dropped OFF the 40-man just one year later because of Injury (in Jaime’s case) or performance (in Thompson’s case). Severino had a very nice season and should be in the mix to be the LOOGY out of the MLB bullpen in 2011. In fact, Jaime was taken off the 40-man on 11/18/10 for just this reason. Whiting, Boomer OF: light hitting speedy center fielder. A .313 slugging percentage in the weaker AAA league just isn’t going to cut it. He’s not in the mix for even a backup OF spot in the majors and seems destined to be an organizational guy/career minor leaguer. Mandel, Jeff RHP: a decent starter for the Nats over the past couple of seasons who moved to the bullpen in Syracuse towards the end of the season. He’s not overpowering and not a high K/9 guy, and seems to be now a middle relief guy at best. Might be worth the protection since he may be a candidate for the 2011 MLB bullpen. Wilkie, Josh RHP: I didn’t initially have Wilkie on the list, since we got him as an undrafted FA. Zuckerman noted that he is rule5 eligible so we’ll discuss. He has definitely performed for this franchise through the years, and was showcased in the 2010 AFL. Having just finished his 5th professional season, he has methodically moved up the ranks and spent the entire 2010 in Syracuse. He’s a middle reliever, a righty, with a good BA against and good peripheral numbers. Is this worth protection in the draft? Perhaps. I feel he could compete for a spot in the MLB bullpen in 2011 but he’s behind several other proven right handed throwers and may be destined for AAA again. Rhinehart, Bill 1B/OF: demoted towards the end of the season to Potomac. Now a 26-yr old guy who hasn’t been successful above High-A. Days are numbered. Marrero, Chris 1B/OF: our first round draft pick in 2006 and pretty much the sole first baseman prospect in the system. He played a full season at AA and put up a decent line (.294/.350/.450) with 18 homers as a relatively young player in the league (he turned 22 in July). I don’t know if he can turn into a producer at the MLB level and a large FA contract to Dunn or Pena could block him even further. But he merits protection until we find out what we have with him. Peacock, Brad RHP: He has been a decently effective starter for the team on multiple levels, this year stepping it up in terms of K/9. He’s at the Arizona Fall League working out of the bullpen and is putting up similar numbers there that he did in the regular season (good k/9 numbers but an eras in the mid 4s). Putting Peacock in the AFL surely will increase his visibility, but his mediocre performance there probably guarantees his safety in the Rule5 draft. No need to protect him, but we hope he turns into a decent middle relief option in a couple years. 11/20/10 Correction; as noted by Kilgore here, Peacock’s Draft-Follow-Evaluate status means he gets one extra year. We’ll revist in 2011. Meyers, Brad RHP. Meyers was the ace of the 2009 league winning Potomac staff and was named the Nats minor league pitcher of the year. For 2010 he moved up to Harrisburg and was dominant in his first 6 starts there (1.47 era, 35 ks in 30 innings and under a 1.00 whip) before going down with complications to foot surgery and failing to pitch the rest of the season. Because of this injury he seems a safe bet NOT to need protection despite his capabilities; no team is going to guarantee a 25-man roster spot all season to a guy who hasn’t pitched since June and who has never appeared above AA. But we may want to be safer than sorry. Solano, Jhonatan C: another who I didn’t initially have on this list, the Nats got him as an undrafted FA in 2006 and he is rule5 eligible. While you never like to lose catching depth out of your system, suddenly the Nats are swimming in it. We have 4 catchers on the 40-man right now, and that’s two too many for the MLB roster as it is. We are probably non-tendering Nieves at some point but that means one of Flores or Ramos is starting in AAA. Derek Norris is definitely moving up to Harrisburg for 2011, so that means Solano is designed to be a backup either way. He’s not going to get picked up in a rule5 draft, so we can leave him unprotected. Potomac, Hagerstown or Vermont. It is really difficult to think that any player at A-ball or below is seriously a candidate to be taken in the Rule5 draft, but we’ll zip through the candidates. Alaniz, Adrian RHP: put up pretty good numbers at Potomac after losing out in a rotational numbers game in spring training. Has now spent parts of 3 straight seasons in Harrisburg but cannot stick. He’s getting too old for A ball though and might need to show something out of spring to keep a pitching job. Phillabaum, Justin RHP: he’s a later-innings/8th inning guy who got hit very hard this year in Potomac. Beno, Martin RHP: no progress for the righty, having played the entire 2009 and 2010 seasons in high-A. Gibson, Glenn RHP: traded to the Rays to obtain Elijah Dukes and then released. I guess the Nats picked him back up because they liked him enough to draft him in the first place. Assigned to Hagerstown, demoted to Vermont after putting up an 8+ ERA. Not a prospect. 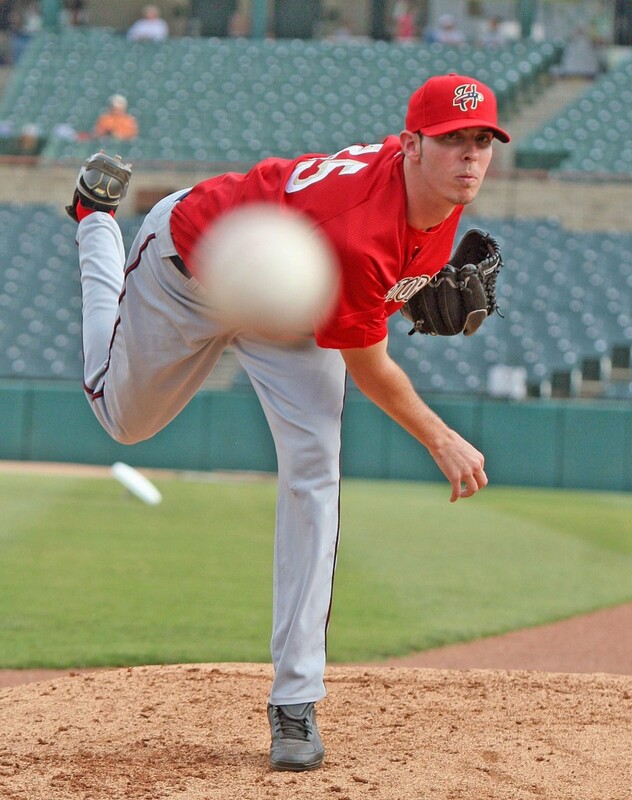 Erb, Shane RHP: he posted a 6.19 era at low-A this year, the LOWEST ERA he’s had in 3 years in the system. Days are numbered in the organization. King, Stephen 3B: struggled between short and low A this year, and possibly still held in contempt by the organization for a 50-game drug suspension that cost him the early part of the year. May be out of a job soon. Lyons, Dan, 3B: Batted .223 between low-A and high-A as a 26 year old. Clearly too old for either level and may be outright released. If I were the Nats i’d protect Mandel, Marrero and Meyers to be safe. With the Jaime move that would put us exactly at 40/40 on the 40-man. At that point we possibly consider adding in Peacock or Wilkie but probably not: if one or the other of these two needed to go on, we have a few guys who could be dumped off the 40-man and probably would clear waivers. « Nats Lineup when all Trade/FA rumors go through. Subscribe to comments with RSS or TrackBack to 'Rule 5 Protection Decisions for 2010'.